This entry provides the details of an interesting exploit I had found recently. If you haven't done so, please read the introductory entry before reading on, as some of the information is not repeated. Before going on to describe the actual exploit, I'll analyze the various elements of the website stressing their relevant properties. The mock-website's domain is g1.playground.quaji.com. 1. www. - the public site. This section contains all the publicly available pages. In the mock-site there is a search page in search.php. 2. client. - the client site. This is the section requiring login. (login.php). Access here is session based. The session cookie is set to the client sub-domain (client.g1.playground.quaji.com). Upon successful log-in, a menu is shown (menu.php) with a link to the Printing system. As described in the previous entry, a click on this link causes a two step process: browser goes to printAutoLogin.php which contains the user's previously entered credentials in a form which is auto-submitted to printSystem.php which attempts to validate them. First off search.php contains an obvious XSS vulnerability. By injecting malicious values in the query parameter we can have the page do whatever we want. But what can we do with it? It does not contain the session cookie because its on a different domain (www. vs client.) and an XMLHTTP request to printAutoLogin.php would also fail for the same reason: violation of the same origin policy. So we have to look onward. 1. It seems that printAutoLogin.php works on authentication-failed sessions too! When entering invalid credentials in the login page (login.php), a fail message is rightfully displayed. But printAutoLogin.php still returns the invalid parameters on their way to printSystem.php. Apparently the server code saves them too early. But there's no harm in that right? the printing system authentication would just find them equally invalid and deny access. So no harm there. Right? 2. It seems that printAutoLogin.php does not escape the outputted credentials! This is basically another XSS. Malicious content can be entered at login.php, and printAutoLogin.php would echo them. This is an odd type of XSS because its not reflected, nor is it exactly stored: Its only available in the current session! Other users can't see it. We could in theory, use CSRF to write malicious parameters to the login page in the user's session. Then printAutoLogin.php would do whatever we want, but in doing so we run over the very details we were after. The user's credentials! 3. Did you know it's possible to have multiple cookies with the same name?! It's even legitamate, and supported by all modern browsers. A cookie is identified by its name, path, and domain parts. So if a second cookie is set having the same name but a different path or domain then another cookie, both will be sent along with subsequent requests. precede those with less specific. When presented with multiple Session cookies, the server takes the first one and discards the rest. I am not sure this is ubiquitous with all server software but its what happens with the audited server, and with the mock-website server. The original session cookie has path /. In order to create a second cookie that would precede the first one, its path should be more specific. For example: /printAutoLogin.php (yes, path could be an actual file). With all this we can construct the full attack. Figure 1. The double XSS, back-flip exploit show down. 1. 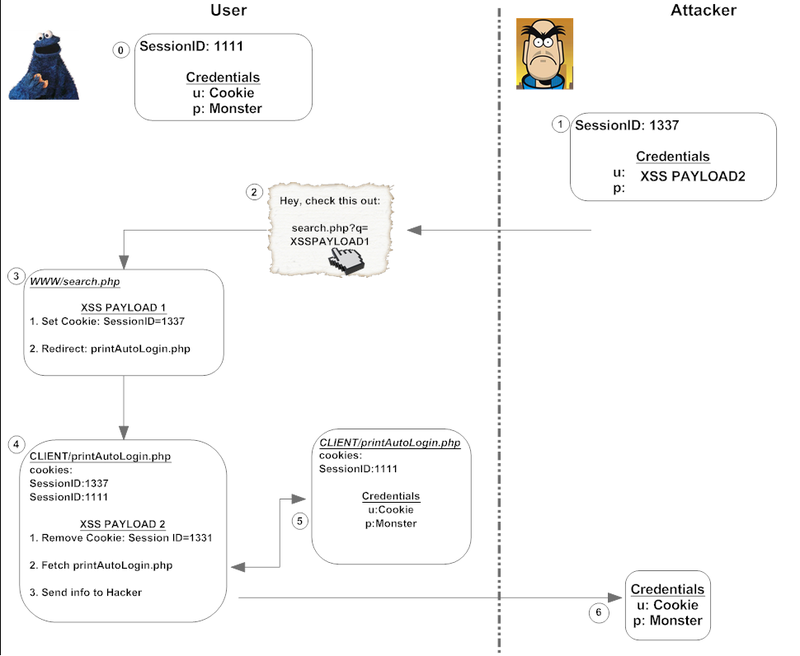 The attacker manually creates a session (ID=1337) on his own computer with malicious credentials that comprise an XSS payload (XSS Payload 2). He must then make sure the session does not invalidate by using keep-alives. 2. The attacker attempts to initiate an XSS attack using search.php (Payload One) on the user. For example, in the form of a link in an email messagew. 3.1 Set a second Session ID cookie (value 1337) to path /printAutoLogin.php. This cookie does not erase the previous one, but rather precedes it in precedence (as explained above). 3.2 Redirect browser to printAutoLogin.php. 4.1 Remove newly set session Cookie. Original cookie is intact. I hope you enjoyed reading this as much as I writing it! Thats great read and work too. Fantastic to read through, a good practical example too. As a web application coder it's invaluable information to get pieces of demonstration like this to ensure that we don't fall into the trap. It's also a good example for us relative newbies in the security world to make a start at penetration testing generally. Many thanks for the write up and mock site! WHAT WAS THE XSS PAYLOAD 2 THAT YOU USE ??? Yes, How attacker creates "XSS PAYLOAD 2" is not so clear & it only works with PHPSESSID=1337. Please explain how XSS Payload 2 is added to printAutoLogin.php's password field. He attempts to log-in with a username and password that make up XSS PAYLOAD 2. The log-in obviously fails, but he makes use of the session ID. Great article!! Very informative and enjoyable ready. I’m hoping the same very best perform from you in the long run also. In fact your inventive writing skills has inspired me to begin my own blog engine blog now. Different things you may require vary from area to area. It is an easy win to call the area before going out to figure out what you should have with you. Your post is very nice and meaningful. It brings me many valuable knowledge about Information Security, now I need to be careful with online crime. Thanks to share.